The Hungarian case raises serious challenges for the European Union. Much has been written on the limited legal instruments that the Court of Justice of the European Union (CJEU) has at its disposal to remedy democratic backsliding, and on the lack of political will power among European elites to address the issue. But the difficulties European institutions face in tackling the Hungarian problem also result from a misleading diagnosis. Whether external observers use the term or not, they often implicitly accept the qualification of illiberal democracy championed by Viktor Orbán. Journalists, Members of the European Parliament and European courts alike criticise the Fidesz government for particular measures that challenge the distinctly liberal elements of liberal democracy, such as minority rights and the rule of law. This approach has been unfruitful to date partly because of the governing party’s masterful navigation of the EU’s legal red lines. By focusing on specific violations of minority rights, political and judicial actors enter a bargaining process that Fidesz always wins. What is lost from sight in this process is the agenda that these measures serve: to undermine the expression of popular sovereignty itself, and thus the characteristically democratic quality of the Hungarian political system. Few dictators claim today that their regime is authoritarian. Democracy acts as a normative ideal everywhere, as minimal standards often condition international aid, healthy diplomatic relations and business prospects. This is particularly true in the EU, initially founded to preserve peace and democracy on the continent. Fidesz has created one of the most sophisticated hybrid regimes in the world today in an effort to adapt to the European legal environment. It uses a number of intricate strategies to escape the harsher criticisms that could be levelled against a more openly authoritarian regime. First, this mode of government does not use state violence in a way that observers commonly associate with authoritarianism. The December 2018 protests against Fidesz’s ‘slave law’ were neither banned nor met with excessive police brutality. Political contestation is, more broadly, authorised: the centre-left MSZP still runs for elections, new parties such as Momentum have been created, scarce alternative online media sources still exist, and activists from the Two-Tailed Dog party periodically ridicule the government with satirical happenings. Fidesz also has a legalistic approach to institutional reform and upholds a weak understanding of the rule of law. We expect authoritarian regimes to disrespect the law through, for instance, voter fraud or extra-judicial executions. But Fidesz has gained a sufficiently large majority in the last three general elections that it can change the system to its advantage rather than bend or break its rules. An entirely new constitution thus entered into force in 2011, subsequently amended seven times. When rare pieces of legislation were declared problematic in 2012 by the now faithful Constitutional Court, the Fidesz majority simply included the incriminated laws into the constitution itself, thus nominally preserving the hierarchy of norms in Hungary. Relatedly, the Hungarian government does not outlaw bastions of opposition with governmental decrees. Rather, Parliament votes on laws formulated in general terms, but with conditions that only apply to a limited set of actors. One of the most striking examples of such a technique is the April 2017 “lex-CEU”, which outlawed foreign higher education institutions without a campus in their state of origin. The only university to which these conditions applied, the notoriously liberal Central European University (CEU), was forced to move to Vienna in December 2018. Hungary has also complied with the European Commission and CJEU’s decisions in the multiple cases of infringement that it has faced, all-the-while leaving unaddressed the underlying issues that targeted measures raise for fundamental democratic principles. This is evident in the fallout of the November 2012 CJEU Commission v. Hungary case, which sanctioned a new Hungarian law lowering the retirement age of judges from 62 to 70 for violating the principle of non-discrimination on grounds of age. The Hungarian government satisfied European institutions but did not address the assault on judicial independence that these measures entailed: only 56 judges refused compensation and were reinstated, thereby allowing the Hungarian government to nominate over 200 new, loyal judges by the end of 2013. 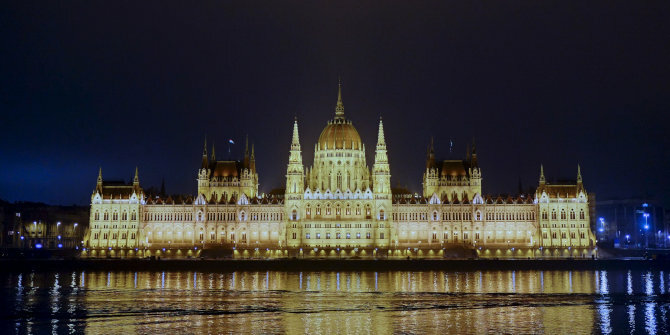 Next, the Hungarian government regularly refers to general principles of law and examples from other European democracies to justify its reforms. For instance, Fidesz has argued that its recent decision to create a new administrative branch of the judiciary follows Venice Commission recommendations and has cited Austria, the Czech Republic, Germany and Poland as countries that already have such a system in place. This measure will nevertheless allow the Hungarian Minister of Justice to nominate a large number of judges in charge of sensitive issues such as cases of corruption, the right to protest or electoral regulations. Finally, legislative change is only the visible part of the iceberg. The systemic transformation also proceeds from a growing collusion between Fidesz and a number of private actors that have a stake in the new system. This is particularly evident in the media sector, where advertisement revenue has flooded pro-government outlets and starved more critical voices. The two major centre-left and centre-right Hungarian newspapers Népszabadság and Magyar Nemzet were for instance deserted by advertisers in the past five years and forced to shut down. Many of the individual steps taken by Fidesz are thus formulated in such a way as to evade uncompromising legal sanctions. By focusing on these isolated measures, there is also a risk of losing track of the overarching system that their sum is creating, and that European courts are even less equipped to sanction. Beyond judicial action, then, observers have called for EU institutions, chiefly the European Parliament, to take a more distinctly political stand on the Hungarian case. This line has certainly advanced in recent months. On September 12, 2018, the European Parliament reached a decision to launch the first step of the procedure laid out in article 7(1) TEU, asking the Council to establish the “clear risk of a serious breach” of the democratic values referred to in Article 2 TEU. In this new phase of confrontation with the Hungarian government, it will be essential for European leaders to clarify and sharpen the terms of their critique. This will require overcoming their deep discomfort at meddling with what they still see as the constitutional integrity of a sovereign and at least formally democratic country. Fidesz has, after all, won a supra majority in the last three general elections, and remains by far the most popular party in Hungary. Implicit in the EU’s caution to date is an acceptance of the position of Viktor Orbán himself: the Hungarian state may not be liberal anymore, as it restricts minority rights and stretches the meaning of the rule of law; but it is still democratic to the extent that it proceeds from the principle of popular sovereignty and is legitimated by a majority of Hungarians. This opposition between the rights of the minority and the will of the majority is, however, deeply misguided. Over the last eight years Fidesz has changed every aspect of the Hungarian political system to ensure that only a majority that supports it can emerge. Mainstream media outlets that were critical of the government have disappeared from the private sector and public television and radio are pro-Fidesz in their content. Schools teach a programme that supports the regime’s nationalist ideology. The CEU’s move will soon drain the capital of potential opponents and nosy foreigners. The fact that opposition voices cannot weigh in on public debate means that they cannot overcome their minority status. Within this system, it is harder by the day for a different majority to form within society and support a new governing coalition. Even so, only a supra-majority could undo the institutional changes that Fidesz has initiated in the past eight years. Slowly but surely, the current situation becomes irreversible by peaceful means. In this process, it is not only liberal principles that are being trampled on, but also the notion of popular sovereignty itself. The People is neither static nor monolithic. Plurality, contradiction and change characterise any free political community: the People debates, judges, changes its mind, and holds its leaders accountable. Fidesz, however, only admits to one legitimate understanding of the People, and has frozen the country in its image: those who disagree can comply or leave, but they cannot influence the exercise of political power anymore. A change of approach to the Hungarian problem is thus needed. Sanctioning individual measures contains the issue somewhat, but it fails to address the broader issue of regime change at stake. The piecemeal method maintains the illusion that the problem we are faced with is primarily one of illiberalism, and thus of the violation of minority rights that can partly be redressed through judicial action. In the meantime, we lose track of what Fidesz is doing: crippling the sovereign expression of the Hungarian People and, in the process, destroying not only liberalism, but democracy itself. Lise Esther Herman is a Lecturer in Politics at the University of Exeter. Scheppele, Kim Lane. “What can the European Commission do when member states violate basic principles of the European Union? The case for systemic infringement actions.” Princeton University, November (2013).